We've never seen a film in which coming back from the dead was very much fun, and Truly, Madly, Deeply doesn't make any exceptions to this rule. When Alan Rickman's character Jamie returns, however, it's at the end of forty minutes of depressing dialogue, so there is at least a sense of relief, if nothing else. Of course, the terms of his "resurrection" become awful as well, so viewers are generally glad when that's over, too. The movie begins after Jamie's death, sparing us any profundities on his part before he croaks. 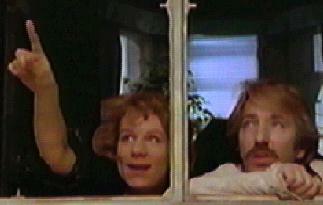 His girlfriend, Nina (Juliet Stevenson), is left with a gaping hole in her life. She loved Jamie desperately, and can barely function without him. But hey, she buys an ugly little flat, trudges through her job as an interpreter, and bawls during sessions with her therapist. Her imagination is still playing tricks on her, and she can hear Jamie telling her to brush her teeth or close the back door. Sometimes he even speaks in Spanish. After a bit too much of this, Jamie miraculously returns without the aid of special effects. He doesn't walk through walls, he doesn't glow, and he can still play the cello. (Hmmm... maybe that's the special effect.) There are drawbacks to being a ghost, however: ghosts are perpetually cold at room temperature, they don't sleep, and they love watching movies. (OK, maybe that isn't a drawback.) Although their reunion is joyous at first, Nina is soon driven to frustration when Jamie and his newfound dead friends from all periods of history turn her house upside-down in order to relieve their eternal boredom. Of course, there is soon a new (living) man vying for Nina's attentions, and Nina must ultimately choose between the dead and the living. These scenes with Mark (Michael Maloney) are the payoff in Truly, Madly, Deeply -- it's not long before we're ready to kick Jamie and his ectoplasmic buddies out of the flat. But for Nina, the decision is much more difficult, and she risks alienating Mark while she decides which path to take. We're kind of surprised that Juliet Stevenson doesn't have more of a following here in the States -- other British actresses in sentimental British films tend to draw all kinds of attention (can you say Emma Thompson?). Stevenson, however, works steadily and will soon be recognized by the larger moviegoing populace, we're sure. She recently appeared as Mrs. Elton in Emma, unfortunately the most boring of the various Jane Austen movies that have cropped up recent years. In this film, however, Stevenson is perfect for the part, reflecting that classic vulnerable gentility that works so well with a female British accent. Rickman is one of our favorite character actors, and while we're glad to see him appear when he first re-materializes in Nina's life, his character quickly becomes tiresome. Not only is he handicapped by the physical facts of being a ghost (like the fact that he has to keep the house temperature above ninety degrees), death has also made him somewhat selfish. He lectures and postures, and re-arranges the house while Nina is gone. This ghost makes life difficult for Nina, underscoring the basic difference between them -- she has a life, and he doesn't. The best scenes in Truly, Madly, Deeply are the silly scenes, the ones that make you grin like a dancin' fool and make you feel good to be alive. They stand in stark contrast to the otherwise leisurely and thoughtful pace of the film, reminding you that although Nina is at first mired in the past, with the dead, she is alive and belongs with the living. Aw, c'mon, there wasn't really any doubt, was there?